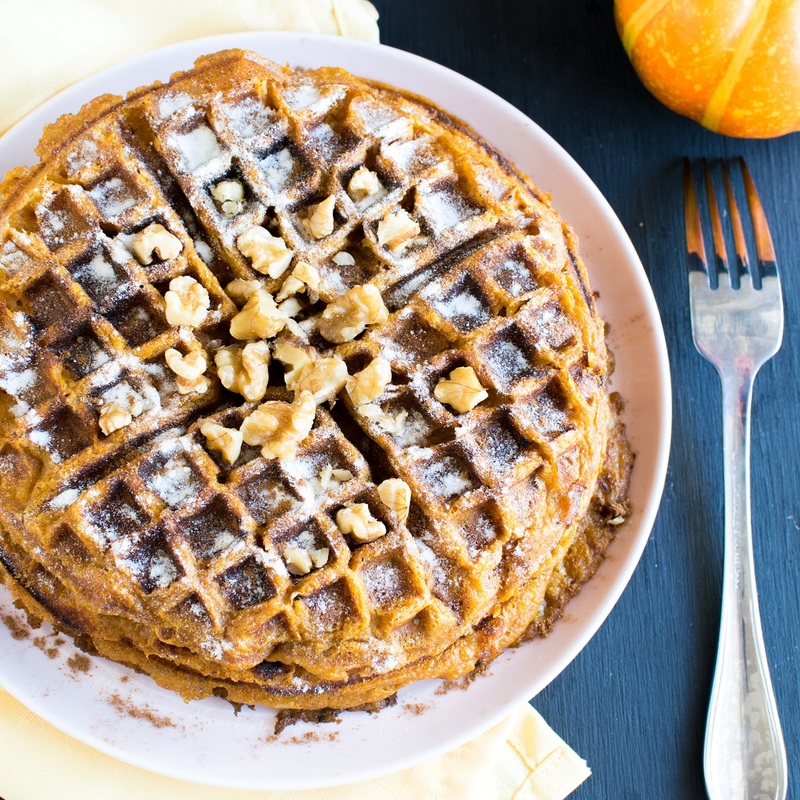 Pumpkin Pie Spice Spelt Waffles are light and fluffy with delectable fall flavors. It’s perfect for serious breakfast lovers especially when the air is cold and you crave for warm morning meal. I love this holiday season where I get ample opportunities to experiment in the kitchen without sweating. These waffles are guilt free and are made of high fiber whole grains spelt flour. These have no added sugar and you won’t believe that it is vegan. All you need is to drizzle pure maple syrup generously and voila! 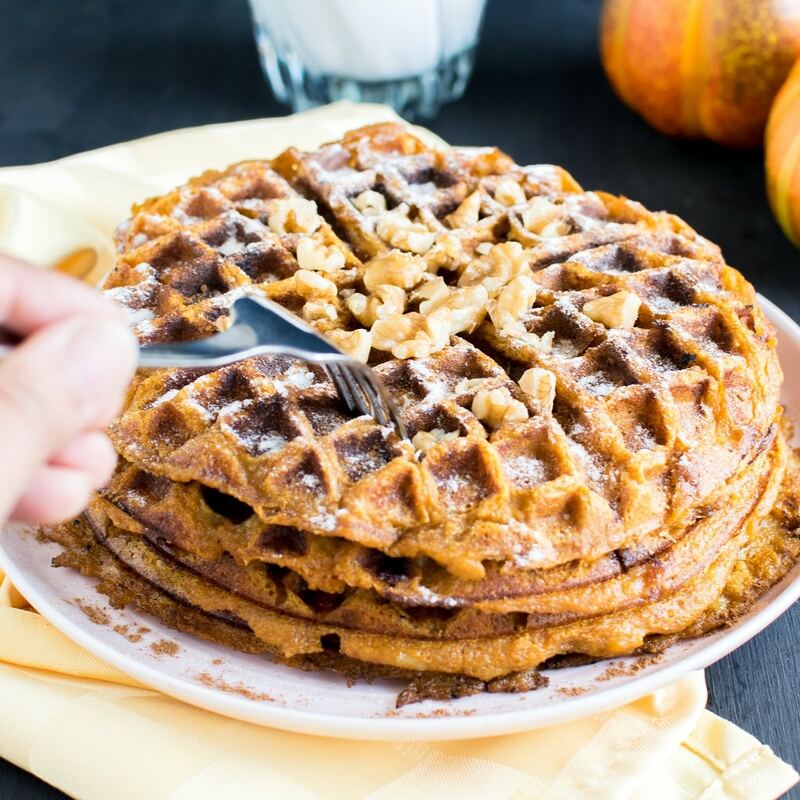 The smoothness of the waffles and the chewy soft texture simply melting in the mouth tantalizes the taste buds with fall flavors. This will make you crave for it again and again and again….. I prefer making my own waffle batter rather than using a store bought waffle mix. The only reason to do is to include nutritious and healthy organic ingredients of my choice. That way I know what I am feeding to my family. I combined whole grain spelt flour along with baking powder to fluff and salt. Then comes my favorite part….. i.e. mixing pumpkin pie spice mix into the dry ingredients. This step just smells so much Autumn/Fall. Thereafter, I added pumpkin puree and mashed bananas. Afterwards I added some vanilla and dairy free milk to whip up the batter. The waffle batter smelled so delicious that I kept licking it while trying to focus on making some real waffles. So I would recommend you to make a bigger batch of the waffle batter if you also like to lick the batter while cooking. (Or is it just me?) . Well, I generally make extra waffle batter because Yashvi and I both end up licking it while preparing for breakfast/brunch. 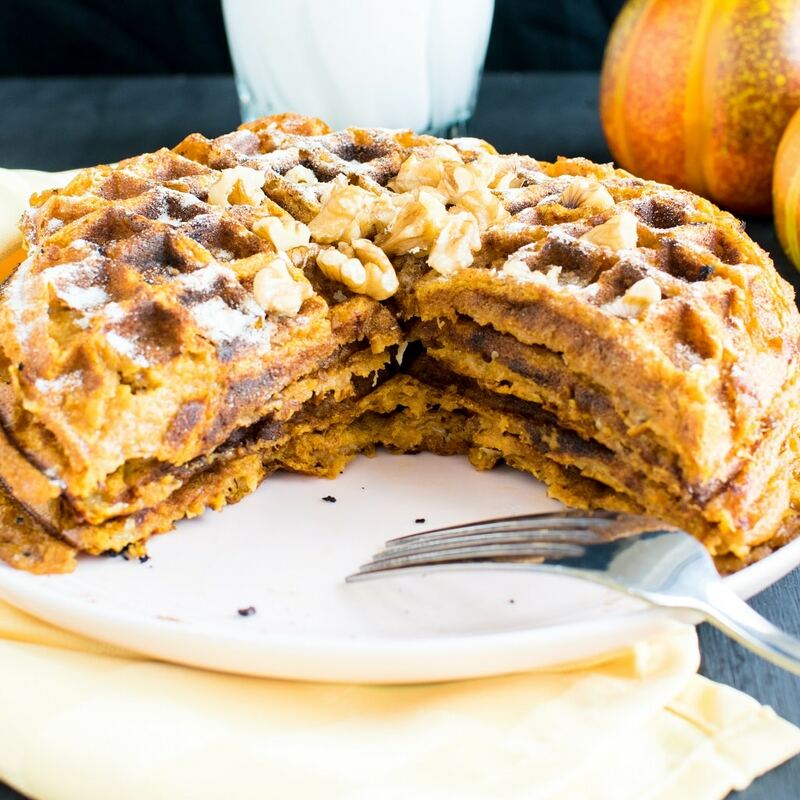 Even though I am not a big fan of pumpkin pie spice flavor but I am totally smitten by these waffles because these turned out to be seriously satisfying and flavorful in my first attempt. 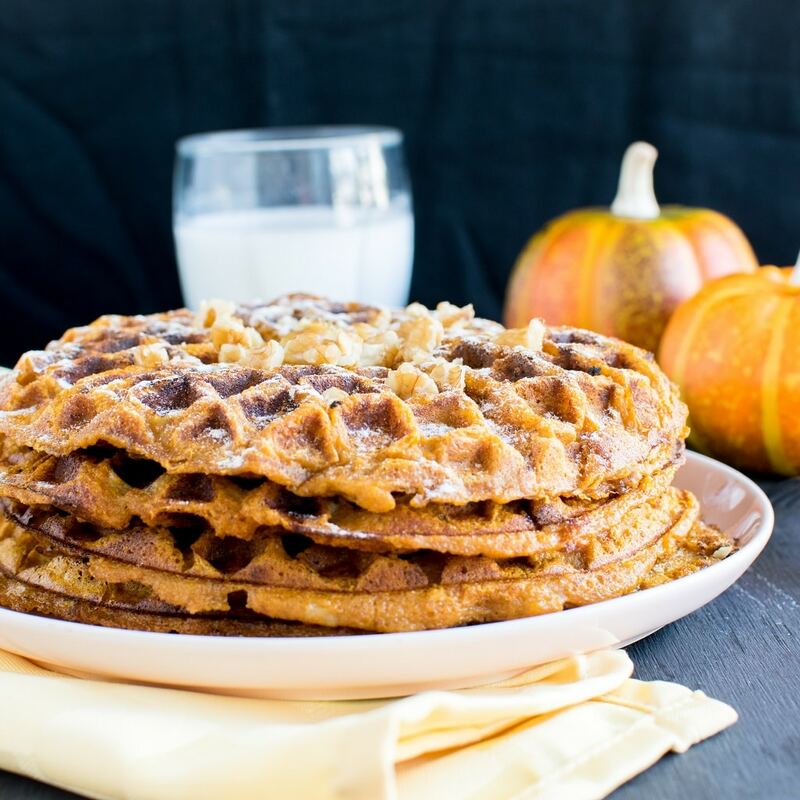 These Pumpkin Pie Spice Spelt Waffles vanished immediately over the weekend and my family craved for more. I am making these waffles again next weekend. 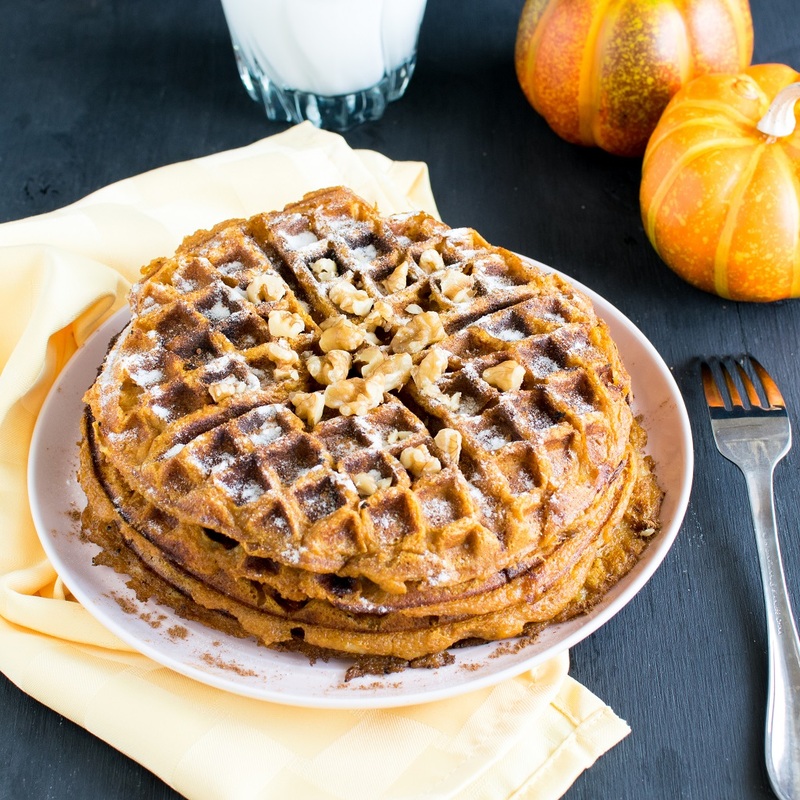 Therefore, head on to your kitchen to try out these delectable and mouthwatering and aromatic Pumpkin Pie Spice Spelt Waffles. In a large mixing bowl combine spelt flour, baking powder, salt and pumpkin pie spice mix. Mix it well until all ingredients are well blended. Now add rest of the ingredients and whip it for some time or until all the ingredients are well mixed and combined. Heat a nonstick waffle maker and grease it with cooking spray. Spoon the batter (about 3 tbsp. heaped) at the center of the waffle maker and cook as per the manufacturer instructor. Gently scoop the waffle out and sprinkle some powdered sugar/vanilla powder, nuts, more pumpkin pie spice (if desired), syrup and or fruits. Top it as per your choice and enjoy it warm! If you like your waffles crispier. After scooping out from the waffle maker place it in a cookie tray and toast it in an oven toaster until your desired crispiness is achieved. Do not over do or else it will have a burnt taste. This recipe makes about 5 6 inches waffles. These look amazing! I can’t wait to make these this weekend! I like that these are high fiber, and I definitely love the pumpkin! Homemade waffles are definitely the best! These look so delicious and love the pumpkin addition. Thank you Ben.It indeed is.